You are here: Home / Golf Psychology Videos / Do You Know If You Have The Yips? Dr. Patrick Cohn discusses the putting yips, the chipping yips, and the full-swing yips for golfers. The putting yips are a perplexing issue for many golfers and if not solved can cause many golfers to give up a game they love to play. How golfers can know when they have the yips and it’s not a mechanical issue. Can you putt freely in practice but it feels different on the course? Does your mindset change about putting on the course? You’ll find one big sign that you have the yips. It feels free on the practice putting green and you can make putts without flinching or stabbing at the ball. But when you go to the golf course, you feel like a different golfer…. It’s no longer free or relaxed. 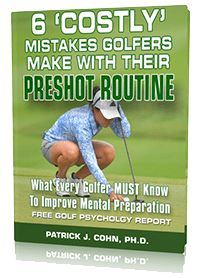 Watch the video below to learn what mental game tips Dr. Cohn gives to golfers to identify if they have the yips.